"The Roman Catholic Church should change the "unjust, discriminatory" rule of denying women the right to be priests, said a Catholic group pushing for reform. Without the church's approval, the Roman Catholic Womenpriests Movement ordained two people, James Lauder of Victoria and Monica Kilburn-Smith of Calgary, as Roman Catholic priests yesterday at St. Aidan's United Church in Victoria. " "Previously, church leaders had cobbled together responses to claims of women's ordination based on other laws on misuse of sacraments, said the Rev. Joseph Fox, professor of canon law at the Dominican House of Studies in Washington, D.C. Some of those required automatic excommunication, while others, including one of the most applicable ones, did not, he said. "This is a law that didn't exist before," he said. But it won't apply to cases that happened before it was published, he said." I read with interest the Vatican decree on women's ordination and excommunication, which leaves me a bit saddened at having been left out…of an "honor" to which I, and fellow members of the congregations to whom priests of the Roman Catholic Womenpriests minister, feel we are equally "entitled." My wife Helen and I are Catholic grade school, high school (SJ & OP), and University (Loyola U) graduates, and we are common sense, Holy Spirit-filled Catholics, in good standing. We attend, when we are in Florida in the winter, Bridget Mary Meehan's Mary Mother of Jesus Housechurch, and are active, supportive members of that little community. We are in complete solidarity with our pastor, Bridget Mary, and if she is to be 'chastised,' 'punished,' or excommunicated---a move with neither sense nor wisdom--we then feel we must be included in such an edict. 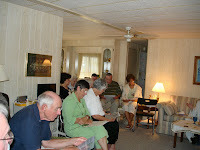 Though we are convinced of the invalidity of the "celibate males only" man-made rule (based on unexamined and specious dogma), and the extreme resort to "excommunication," nonetheless, be that the approach of 'official church,' then we don't think it just for you to have Bridget Mary, other friends of ours in RCWP, and the RCWP Bishops 'burned at the stake,' without including us, their supporters in the same 'reward.' Very similar to Jesus, and the women and men who were His true followers, isn't it? As I am so persuaded that the Holy Spirit is NOT behind this Vatican's decree on excommunication, I am equally convinced the Holy Spirit IS indeed the motivating Force in this long-overdue change in the Church of Jesus Christ, our Church. I send this note through our Pastor, Bridget Mary, and our Shepards, Bishop Dana and Bishop Patricia, for their information, not like an hierarchical 'chain-of-command, which is not part of the MO of RCWP. I send this to you in a spirit of love and compassion, praying the same Holy Spirit, Who prompted me to write this, will touch you as you read it, and open your mind and heart to what that same Spirit wants you to receive. "Vatican weighs in on women's ordinations"
"Hudson said that since her ordination, she and McGrath have traveled extensively, giving talks and celebrating Mass in a number of Midwestern cities. 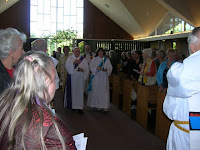 She said the group has recently had ordinations in Minnesota and Canada, and upcoming ordinations are scheduled in Oregon and Massachussetts.Hudson said there were 29 Roman Catholic Womenpriest priests in the U.S. (with 21 deacons waiting to be ordained as priests in the organization) and about 75 Roman Catholic Womenpriest priests around the world. "It's amazing to us how much of a problem 75 people are causing for the all-powerful Catholic church," said Hudson, who said the Vatican decree was evidence that Rome is "running scared. ""If anything, (the decree) gives us more impetus to go forward because it means we've got their attention," said Hudson. "The people are behind us." ROME — The Vatican on Friday reaffirmed a ban on ordaining women as priests, warning that the consequences of any such ordination would be the automatic excommunication of anyone involved. ... In the past six years, the organization says it has ordained more than 50 women and some men as priests and deacons in North America and Europe. In 2002, the Vatican excommunicated the first seven women shortly after the organization designated them priests. Excommunicated Catholics cannot participate in the sacraments or public ceremonies or hold any ecclesiastical position. "She wanted to become a priest. But the Pope says that position is for men only. For two years, Sister Bridget Mary Meehan has been saying mass at her Falls Church home as, she claims, a Roman Catholic priest. On Friday, the Vatican decreed that women priests and those who ordain them incur in lah-tay senten-see-yay or automatic excommunication. "I was wondering what took them so long," said Meehan. 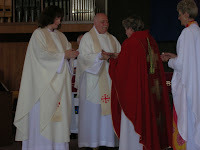 Meehan was ordained on a boat in Pittsburgh by women bishops from Europe, part of a small but growing global movement. She says the excommunication is in a way good news. "Because we're really being recognized now as a movement within the church, even though they do not want to accept us quite yet," said Meehan. The church holds that only men can be priests, citing the 12 male Apostles of Jesus. But meehan, who celebrates mass in her living room these days, argues women were priests in the early church--and says such drastic action isn't fair. "Women are excommunicated. Priests, who are pedophiles, and bishops who covered it up, were not excommunicated. Now, does that really make sense?" She said. But the church sees it differently. "The excommunication will not stop us! In fact, it just encourages us to go forward, to continue to provide hope and to be good news to God's people," said Meehan. Aisha Taylor, executive director of the Women's Ordination Conference, issued the following statement about the Vatican's decree that ordained Roman Catholic women and the bishops who ordained them incur latae sententiae excommunication, which means that the excommunication is immediate and self-imposed. The Women's Ordination Conference is outraged by yesterday's Vatican decree, which reminds Catholic women once again of the animosity they face from the hierarchy, despite being the backbone of most Catholic parishes throughout the world. Out of fear of the growing numbers of ordained women and the overwhelming support they are receiving, the Vatican is trying to preserve what lit tle power they have left by attempting to extinguish the widespread call for women's equality in the church. It will not work. In the face of one closed door after another, Catholic women will continue to make a way when there is none. We reject the notion of excommunication. In our efforts to ordain women into an inclusive and accountable Roman Catholic Church, we see it as contrary to the gospel itself to excommunicate people who are doing good works and responding to injustice and the needs of their communities. While the hierarchy prattles on about excommunication, Catholic women are working for justice and making a positive difference in the world. This unreasonable excommunication and the Vatican's stance on ordination are based on arguments that have been refuted time and again. In 1976, the Vatican's own Pontifical Biblical Commission determined that there is no scriptural reason to prohibit women' s ordination. Jesus included women as full and equal partners in his ministry, and so should the hierarchy. The call for women's equality in the Catholic Church is reverberating loudly in the public consciousness. Around the world, over sixty women have been ordained as priests, deacons or bishops by the group called Roman Catholic Womenpriests (RCWP), and there are nearly 100 women in the RCWP preparation program. There are 16 national organizations from 11 different countries that advocate women's ordination, and a vast majority of US Catholics support the ordination of women. The refusal to ordain women is nothing more than a blatant manifestation of sexism in the church. It is time for the Vatican to listen to its own research, its own theologians and its own people who say that women are equally created in the image of God and are called to serve as priests in a renewed and inclusive Catholic Church. 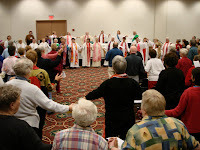 Founded in 1975, the Women's Ordination Conference is the oldest and largest national organization that works to ordain women as priests, deacons and bishops into an inclusive and accountable Roman Catholic Church. WOC represents the 63-70 percent of US Catholics that support the ordination of women as priests. WOC also promotes new perspectives on ordination that call for more accountability and less separation between the clergy and laity. The following is the English translated text of the decree written by the Vatican's Congregation for the Doctrine of the Faith that was published in the Vatican newspaper L'Osservatore Romano. Roman Catholic Womenpriests reject the penalty of excommunication issued by the Vatican Congregation for the Doctrine of the Faith stating that the “women priests and the bishops who ordain them would be excommunicated ‘latae sententiae.” Roman Catholic Womenpriests are loyal members of the church who stand in the prophetic tradition of holy disobedience to an unjust law that discriminates against women. We hold up heroic women in the church’s tradition like Hildegard of Bingen, Joan of Arc and St. Theodore Guerin who obeyed God, followed their consciences and withstood hierarchical oppression including interdict, excommunication and death. In obedience to Jesus, we are disobeying an unjust law. The Catholic Church teaches that a teaching or law of the church is authoritative only if it is “received” by the sensus fidelium, the community of faith. If the community of faith does not accept the law, it has no effect on us. All people have a moral obligation to disobey an unjust law. St. Augustine taught that an unjust law is no law at all. Since 70% of U.S. Catholics favor women’s ordination and a growing majority of Catholics worldwide also favors women’s ordination, we do not “receive” or accept the Church's prohibition against the ordination of women and the church’s continued reliance on sexist metaphors, beliefs and assumptions for denying ordination to women. Recent scholarship affirms that women were ordained in the first thousand years of the church’s history. The first half of the church’s history provides us with images and accounts of the inclusion of women in Holy Orders that contradict the later prohibition. We are reclaiming this important tradition in order to bring equality and balance, and reconciliation and renewal to the church we love, and to all the holy people of God who have been hurt, marginalized, and ostracized in the name of Jesus Christ, who always and everywhere said, as we do, that ALL ARE WELCOME.